Today was Children's Church at our church. The kids "led" the congregation. This meant the choirs sang. Cheese Puff was in a mood. He sat with us, instead of going back to nursery. The nursery lady seems to panic if there's more than one kid in there. And he must have sensed her hesitation. We were stuck with a child who was screaming his head off right before the service started. He calmed down for the most part, and played with the man sitting behind us for a while. Baby Plum's choir sang first, so he joined us. I got nothing out of the service. Usually I don't. Near the end of the service, all of the kids' choirs got up to sing a song. Cheese Puff was not about to let his brother go up on stage without him. Fine. I'd fought him enough. I figured he'd be ok. Baby Plum wouldn't hold his hand, but he would stand by him. After the first chorus, Cheese Puff picked up the song and managed to sing some words. His presence seemed to encourage Baby Plum to actually sing and do some of the dance steps. Little Elvis was on the other end. He's so funny. Dancing is really not his thing. But he tried harder today than usual. Our two younger babies continuing to do the steps. I talked to the little one's choir director this evening and asked if she noticed her stowaway. She said she did, and she thought he did a great job with the song and steps. Then it was time for Little Elvis to do the benediction. Last year, at Christmas, he read some sort of something (I really don't retain much) and impressed the entire church with his reading skills. I didn't think to invite my parents, and didn't take pictures. This time, we took pictures at least. He did a great job.... even though he wasn't feeling well. Little Elvis was sick on Friday night. He was eh on Saturday. On Sunday morning, he seemed better. But was starting to fade by the end of church. We still went to Sam's. He drank some Sprite, but couldn't even eat his pizza. We knew that was bad. Sam's pizza is his favorite food. He seemed to rally for play practice, but by the time Trunk or Treat rolled around this evening, our oldest was fading fast. Here are our three trick-or-treaters! I was very lazy this year. Cheese Puff is Mickey Mouse. He's wearing his Mickey Mouse jacket that my mom got him for Christmas, and some leggings that Baby Plum wore when he was Mickey. Little Elvis is Harry Potter. We borrowed the robe from a friend, and he wore his own glasses. He carried a black drum stick as his wand, and I drew a lightning bolt on his forehead. Baby Plum was the most work. He decided he wanted to be Buzz. I went to the 1/2 price sale at our local thrift shop and got this costume. It fits him pretty well. See how cute they are? Maybe I won't be so lazy next year. But they look cute and were mostly happy, except for the sickly Harry Potter. He laid on Bob's lap right before they went trick or treating, and then as soon as they made their first pass, we packed up and headed home. He didn't eat. Some mornings Baby Plum gets into bed with us. It's my chance to snuggle my not-so-huggable baby. I think he joins us if he wakes up to go to the bathroom. He closed his eyes and murmured, "I was dreaming about chocolate ice cream cones, chocolate cake and chocolate chip cookies." While this child was dreaming of sweets, his older brother was looking under his pillow for money from the tooth fairy. There was none. He went to look at his toothbrush, because that's where the "Tooth Fairy" put it last time she forgot about his tooth. It wasn't there, either. Daddy put the money in his tennis shoe. After breakfast, he went to take the sheets off his bed and said to me, "Let me see if the Tooth Fairy put the money under my pillow during breakfast." I'm not sure what I was doing in there, but I told him that he had a super silly tooth fairy, who liked to play games. Then I told him that I had seen the money, and he would see it when he finished getting dressed. He found the money. I think he might have lost any belief he had in the Tooth Fairy, though. About the tooth, he pulled at school during lunch. It wasn't even that loose. He said the super crunchy pretzel in his lunch loosened it. As for Cheese Puff, he continues to happily sleep in his big boy bed, and LOVES it. The end of the nap era? This is becoming a more common occurrence in our house. Cheese Puff really needs an afternoon nap, but he's not exactly taking one. It all started when he realized he could climb out of his crib. He was pretty good about staying in at night, but during the day, he preferred to scale the sides as soon as the door was shut and run down the hall fist pumping, yelling, "I did it!" But I'm not even attempting a nap in that bed. He does such a good time with it at bedtime that I don't want to risk it. I'm trying to move us to an afternoon nap while picking up his brothers, but some days he just doesn't make it. I believe this was after a big morning in pre-school. He requested applesauce, and in the time it took me to pour him a bowl, he passed out on the couch. Today, he passed out 5 minutes before we left. I went to put up some folded clothes, and found him zonked out on the couch, clutching a car. Lucky for me, he is pretty good at sleeping through a move from the couch to the carseat. He slept right until we pulled back in the driveway, and woke up fairly refreshed. Speaking of the carseat, here's our youngest (and most rhythmic) child dancing to the radio. I wear sunglasses religiously. But I've never been able to get the boys that into wearing them... until recently. Little Elvis received this crazy pair as part of a fundraiser for his school. Cheese Puff wore them for fun that morning, and now I'm not sure where they are. My parents bought the older two boys sunglasses for their Florida trip this summer. Neither wore them, but then this weekend, Baby Plum found the blue pair. He loved being told he looked like a cool dude, and was thrilled to rock out in the being painted sunroom. We went with yellow. Bob finished the wiring last night! The AC guys will come out at the end of the week! And then the contractor will just need to frame out the windows and doors and put in baseboards and crown molding. The outside is done! We are very, very close! Back to my shady boys. All three wanted to wear sunglasses yesterday. They were off for the holiday, but Bob wasn't. 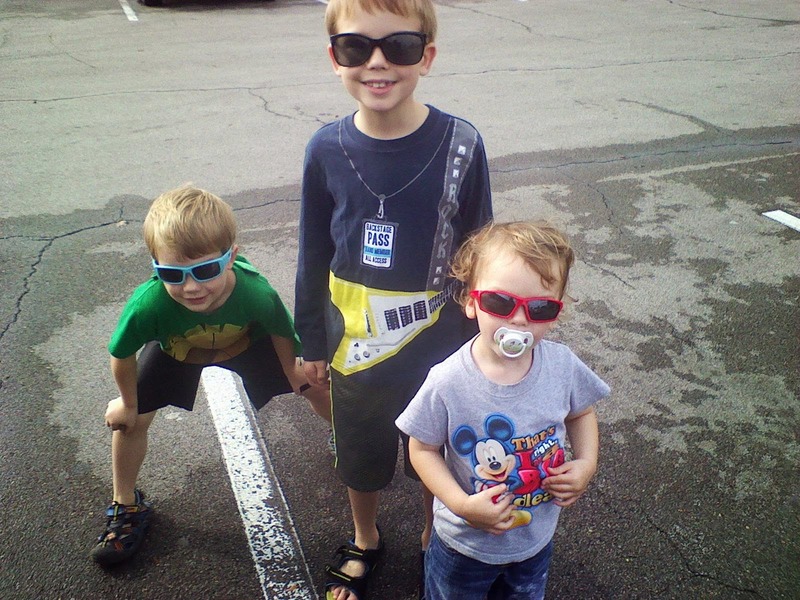 They donned their shades and we headed to the mall to play. Little Elvis is wearing a pair of mine, because I couldn't find his crazy green ones. My alma mater seriously just became the number 1 team in the nation this weekend! (for football) Um, when I went there we got to 19th I think. And that was HUGE for a college in Mississippi. Little Elvis and Baby Plum attempted to watch the game. We watched the first half at my parents' house, then finished up at ours. Little Elvis is such a questioner, and Bob was working on the sunroom. I hope my answers to his many questions were semi-true. He was thrilled when I told him that I was one of the crazy students who stormed the field after the big win against Alabama my freshman year. The students trashed the field and brought down the goal posts. (The craziness begins around minute 9) I believe my date picked me a few stems off of a very trampled plant to remember the game. I threw them away, but I remember the excitement. I'm usually not a part of history, so it was cool to actually tell Little Elvis a personal anecdote. He was so thrilled when they won, that he decided he was going to go there when he grows up. Baby Plum said he would, too. Cheese Puff was cranky from a late afternoon nap, and apparently doesn't want to think that far in advance. A couple of weeks ago my parents took Cheese Puff to a football game all by himself. He loved it! Look at the big little boy watching so intently. I believe it was the homecoming game. They stayed through halftime so he could watch the court presentation. He loved the noise of the game, which is the complete opposite of Little Elvis at that age. But not Baby Plum. Cheese Puff is a lot like his oldest brother, but he has some of Baby Plum's traits as well. Our two youngest are huge music fans. Cheese Puff has gotten to the point where he says, "I don't love it." while we're driving around listening to the radio. He'll also say "I don't like it." It's his polite way of saying he thinks I should change the station. He's gotten to where he shouts out requests when Bob gets the guitar down. "Shot through the heart!" (aka You Give Love a Bad Name) and "Shake your Booty" are his favorites. He likes to strum the guitar while singing "You are my sunshine." Cheese Puff is still at an age where he wants to help. His favorite chore just might be making Mommy and Daddy's bed. See how helpful he is? He's a very cute pillow, or maybe he's a sheet? He decided to pretend to sleep for me as well. It's funny, because this little boy does NOT like to be covered when he sleeps. This might be a problem once it gets colder. Sweet Baby Plum turned 5 last Thursday. It was a super-busy day, but we managed to squeeze in as much fun as possible. We played at Chuck E. Cheese's. They got more than 500 tickets this time! Little Elvis hit a jackpot and won 100 at his first game. That night Baby Plum had another soccer game. He was very excited. See? He likes to stand on the field with his hands in his pockets. We're fine with this, because he's not sucking his thumb. He does run. He's getting a little more aggressive. That night he was delaying bedtime. We gave him one gift that morning. We got him a real easy bake oven. Not one that uses a light. Then we brought out the child-size violin Bob found for him. He was excited. I'm a little worried. We had to have the party at my parents' house, since our sunroom's not done. We had 6 partiers. They didn't really play with the instruments we brought over, but enjoyed the other toys. This is the first time I didn't really fix any cake for parents. I made microphone cupcakes by sticking mini cupcakes inside ice cream cones. There were plenty for kids, but I don't think any adults ate any. That was fine. I usually have way too much cake left over. I also got pop rocks for the party. Most of the kids did not enjoy the pop rocks. Little Elvis enjoyed them, though. Baby Plum seemed to have a good time. He passed out in my mom's arms before we left their house. He napped for a long time, then tried to stay up late that night. He came out of their room after Little Elvis fell asleep and said he wanted to hug me to thank me for his birthday party! I know it was a ruse to stay up late, and it worked. Baby Plum's a funny boy. He's pretty quiet, but it makes sense if you hear how much his brothers talk. He's not very emotional. Little Elvis is all drama, and Baby Plum is more stoic. He's sweet. He's helpful. Well, he used to be helpful. He's ushered in the big 5 by not being very helpful. We're working on that. He's working on reading and still really loves math and matching/memory games. He sings to the radio and impresses me with all of the words he knows. I've had to start changing stations more often to keep him from hearing and repeating things. He's got a best friend who also seems to think of him as a best friend! He really loves soccer and practicing. 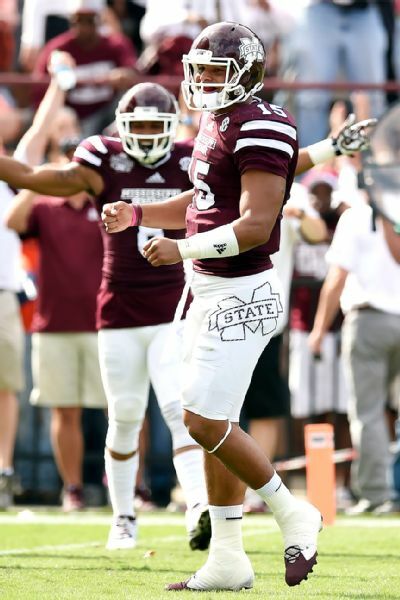 He seems to really enjoy himself on the field. We're very proud of our sweet little boy and we love him very much.